Chat States. Everybody knows them from Instant Messengers or Facebook Chat. Those tiny notifications, which tell you, if your chat partner is currently composing a message, is (in)active or has paused typing. E.g. "XY is typing..."
Each of them - except "gone" - are applicable to a "message input interface". So let's translate them to a JavaFX TextArea! 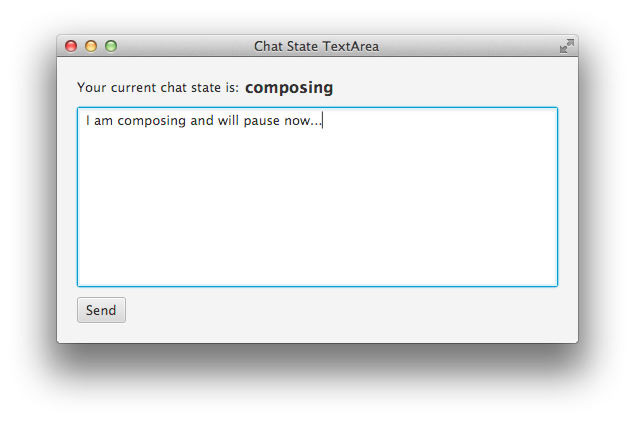 Secondly we have to change to 'composing', whenever the text changes. Easy. And here's my take on a simple implementation. Enjoy! // This is the initial state. // If we have received focus in an empty text field, immediately transition to "active". // If we have received focus in an non-empty text field, transition to "paused". // Start the timer, which will automatically transition to the next state. // We are in "composing" state. // When the time is up, switch to "paused", if there's any text, otherwise to active. // Ommitted getters and setters for clearness.